When coming along to The Glee for Christmas, we understand you may have lots of questions about the process. We have collected together some of the most common questions we get, with their answers here. Hopefully we cover it all, but you can always feel free to contact our box office for a chat with a human on 0871 472 0400. What is a Christmas Comedy Special? A whole night of festive food, cheer & comedy. 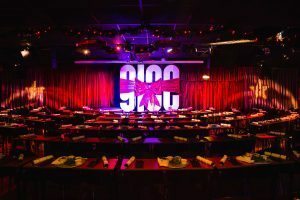 You will see a brilliant selection of comedians, you will have allocated seats & tables, and the option of a one, two or three course festive meal. After the show our resident DJ will kick off our after party which will keep you dancing into the night! You will have been assigned an arrival time slot upon booking, it is essential that all your party arrive in good time to ensure a smooth start to your celebrations. If you have pre-ordered your drinks they will all be waiting for you on you tables, apart from the cocktail jugs which will be brought out to you. Your tables are reserved and our friendly staff will show your party to the seats at the time were assigned when booking. For those who choose the three course option the sharing platters will be on the tables upon arrival. Those who choose the one or two course option will be served shortly after the whole party take their seats. You can choose your puddings on the night from a great seasonal choice on our Christmas grotto. If you have tickets only, you can check in to the main auditorium between 7.30 - 8.15pm. Please arrive in good time as the doors close at the start of the show. The bar within the auditorium will be open from the beginning of your evening until the show starts and re-open during intervals. The show will be in three sections, the MC will introduce each act and each section will last about 30 minutes. There will be two intervals of about 20 minutes to get a drink and some fresh air. Shows will finish at approximately 11.00pm, when your After Show Party will commence! There will be DJs in the bar, playing classics into the small hours. The Glee serve quality Christmas food, but we are not a restaurant able to serve food all night. There is only a narrow window of time to serve you and the hundreds of other customers before the show starts. If everyone sticks to the script, all will run smoothly! Whereas we always aim to be as accommodating as possible, arriving late or arriving with many missing from your party at our busiest time of year will compromise your food service. We apologise in advance but without managing our food service in this way we could not serve everyone in time. We therefore cannot stress enough how important it is that you and your whole party arrive in good time to take your seats at the time the party was allocated when booking. Our auditorium is set out in theatre-style, with tables in front of each row of seats. These rows extend backwards from the stage in a theatre style. Your group will be allocated seats and tables together, which are yours for the night until the comedy show finishes. Our lovely floor staff will show you to these seats when you arrive. Please note: the room may be cleared of these tables and seats after the show. As with all of our shows, you can book immediately with a debit or credit card, with us taking full payment. At Christmas however, we can arrange alternative methods of payment for large groups of 20 or more. Glee is a great night out, whether you are a couple on the tiles, or a group of 200. The capacity’s the limit! If we’ve got the seats available, they’re yours for the taking. Can I add extra tickets to my booking? As long as we still have ticket availability for the show you require, then yes. Get in touch and we’ll take you through it, or go ahead and book those online, adding to your original booking. However, please be aware that at Christmas time, we are extremely busy and completely sell out for most shows well in advance of the date. As with all bookings we highly recommend contacting us as soon as is possible to avoid any disappointment. Do all members of our group need to select the same package? Yes, due to the large number of visitors we have attending our sold-out Christmas parties, we need to streamline things to ensure we can fit everyone in and serve everybody in a timely fashion. Therefore, all members of your party would need to have the same ticket type, so you would all need to have either: ticket only, ticket +1 course meal, ticket +2 course meal or ticket +3 course meal. You would also all need to select the same arrival time. People have dropped out. Can we get their ticket money converted to drinks or food? Sorry no. If you have any drop-outs, please get in touch and we’ll see what we can do for you. Do I have to have the food? Not if you don’t want to, but we think you should - it’s tasty! If you wish to book tickets only, you may do so. We also have a ticket + 1 course meal option, ticket + 2 course and ticket + 3 course option. All prices are as advertised in the brochure & the calendar. Please click here to download a full list of the allergens contained within our Christmas menu. If you would like to discuss anything further, please email christmas@glee.co.uk, or call us on 0871 472 0400. Will I need to order my food selection in advance? Yes please! We need to know what you want for your main course only, you can do this via your MYGLEE account, or by contacting the Christmas box office team on 0871 472 0400 / christmas@glee.co.uk. Our Christmas co-ordinator will be on hand throughout the whole process to help and give you a little reminder. Starters are served as a sharing platter to your table and dessert can be picked from the Grotto on the night. When do you need my food choices by? Food for our Christmas shows must be ordered a minimum of 2 weeks in advance. You can do this as soon as you’ve made your booking by logging into my.glee.co.uk or by emailing the Box Office on christmas@glee.co.uk. If you need to make any alterations to your choices, you can do this up until 2 weeks prior to your show. If in any doubt about anything, don't hesitate to contact our friendly box office team! Is the regular menu available? At Christmas we have a special menu full of festive treats for your tastebuds. The regular menu returns after the big day. You will need to purchase a food inclusive ticket to eat with us at a Christmas Comedy Special, as we won’t be serving any other items. Certainly! You can do this yourself online through MY GLEE once your booking is in. We also have some great drinks packages. Take a look at those and the menu here. We know big groups can be difficult to buy drinks for, so we are more than happy to set up a pre-paid bar tab for you (minimum £300). You can also set up a bar tab on the night of the show with a credit/debit card (we can’t accept American Express i’m afraid). To do this, simply ask for the bar manager who will create and manage the tab for you. Please be aware we may pre-authorise the payment, with a refund given back for the difference at the end of the night. Where are the details of my booking? You can login to the MYGLEE section of the website at any time, to take a look at any current bookings you have with us. We will be keeping in touch with you all throughout the process of your Christmas Party booking, and most of our correspondence will be via email. Please save us to your email contacts, so we don’t get stuck in your spam filters! We are a ticketless venue, it's less hassle for you, and saves a few trees. Once you have booked you will receive an email confirmation of your booking. This is for your own records, there's no need to print it, but do read it through. Upon arriving at the club, we just need the name you booked under, this will gain you entry. If you are unaware of who in your party organised the group, please give a company name. No, wear whatever you feel comfortable in. Some clothes are advised. If you want to wear fancy dress, go for it, we don't have a problem with you looking a bit silly. However, you will be asked to remove anything that gets in the way of other customers' enjoyment of the show (eg, massive hats, flashing lights, noisy items). Also feel free to do your Secret Santa presents opening early on, ideally before the food arrives. Please be aware our security staff may ask to see the contents of your wrapped gifts. Can my friends join me after the comedy? Go on then, it’s Christmas after all! Our after party is primarily for comedy customers, but we don’t mind if Karen from the office wants to pop along to join in with your company’s Christmas celebrations. All we ask is that you provide us with these names ahead of your visit so we can put them on an entry list for our security staff. As ever, we’ll need to see ID if they are lucky enough to look under 25! We have a limited amount of cloakroom space in each venue. Please enquire with the staff on the night. Can you recommend hotels / taxis / parking? All of our venues are central and have good access to accommodation and transport. Please take a look at our Venue Info page for further practical details. Alternatively, a quick internet search using the venue postcode will provide options.